According to John Robb et al., one of the primary enablers of ‘global guerrillas’ is cheap, accessible technology. The possibilities that modern technology allow for are nearly limitless, and much of today’s problems are locked in an escalating war of symmetry. If you’ve ever studied evolution (or possibly just read Michael Crichton’s The Lost World), you’ve probably come across the Red Queen scenario. 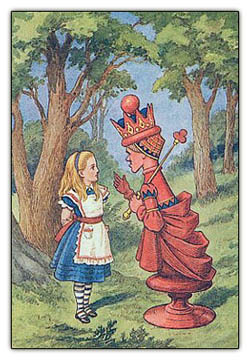 As originally found in Carroll’s Through the Looking-Glass, the queen says to Alice: “It takes all the running you can do, just to stay in the same place.” As a complex system, the Red Queen definitely finds some parallels in warfare. Need to brief from the field? There’s an app for that. Modern technology is miniaturizing and decentralizing, so that tools once in the hand of a battalion commander or higher have devolved to sub-squad levels. An individual soldier now has access not only to real-time satellite intelligence, but also has the ability to reposition those satellites. From the field. For the cost of roughly $1 million per satellite. It’s trial-by-fire, as the military is deployed to several hotspots around the world. Right now, much of the devolved abilities available to the average soldier come through consumer-grade products; iPods and iTouches and the like. To a certain extent, the development of specialist equipment seems redundant. But that’s where the Red Queen comes in. The nature of warfare and arms competition means that the enemies of America are doing the same thing. Both are modernizing as fast as they can, but the technologies take very different paths. Whereas the United States, having seen the potential of these consumer devices, is now rushing to design a proprietary purpose-built system, the other team is making do with what they’ve got. We may be able to control our Predator drones in Pakistan and Afghanistan from thousands of miles away, but the neo-Taliban can “hack” them with $26 software (though as The Security Crank points out, it’s not really hacking). That’s the difference in a nutshell: they make do with what they’ve got (Rumsfeld’s “army you have”); we’re constantly trying to forge our own path. I’m not making a judgment one way or another, but that’s the choice ahead. ‘Open-source warfare’ means that these ideas spread without any additional prompting. With off-the-shelf technology, you can go right ahead and set up a self-organizing peer-to-peer wifi network. The neo-Taliban has been cracking and forcing cell networks offline in Afghanistan for years, and we can merely react. It’s really an open-ended question as to where this all might lead. You can’t stifle innovation at home just for the sake of denying advantages to our adversaries (besides, it’s not like they operate on the cutting edge). We’re running as fast as we can just to stay standing. Interesting, however I think this Red Queen hypothesis within the context of the Taliban is just a furthering of its placement in warfare as a condition of humanity. Philip II of Macedon will never be as famous as his son Alexander, even though the latter basically inherited the military revolution that would lead to his hilariously massive conquest. Much in the same way that the arrival of the Gatling gun changed the game in Japan, this hypothesis works for the timeline of man’s continued desire to find better ways to hedge against their enemies. This isn’t always planned. Look at the Merimack (or CSS Virginia) and the Monitor. In a basically accidental evolutionary leap, the United States antiquated the navies of the rest of the world. In essence the steps that are the most dangerous are ones like the Ironclad, moments when somehow, somewhere the entire paradigm comes crashing down.